This White Cottage Style Wood Birdhouse with unpainted Nest Box Bird House would be a great addition to your home. It has a removable back wall with a side entry hole to a single. This Bunny Rabbit Outdoor Garden Statue in Brown Resin would be a great addition to your home. It has a hand-made from durable high-quality polyresin and hand painted. In quiet moments, we notice the beauty around us. This Solar Powered No Wind Required Realistic Fabric Butterflies Spinning Vine will bring a touch of nature's majesty into your home for your enjoyment. Fabric butterflies swirl and perch around the metal vine frame of this mobile, spreading their red, orange, and black wings. This mobile is solar-powered, which means it requires light - not wind - to turn the curling frame and magnetized butterflies. Join in the creativity by arranging six assorted butterflies as desired. The mobile adheres to the window with two quality suction cups on a metal hook. This Solar Powered No Wind Required Realistic Fabric Butterflies Spinning Vine is made in the USA and comes with a one-year warranty against defects and workmanship. This Copper Finish Triple Tube Bird Feeder has a copper finish design around the ports to protect from squirrel damage - perfect for those with heavy squirrel traffic. The feeder protects against not only squirrels, but weather elements as well with its powder-coating. The feeder is a breeze to fill and clean and is sure to keep birds happy all season long! This Green Glazed Ceramic Fountain Bird Bath with Frog and Solar Pump is a green, glazed-ceramic solar-powered water fountain that will add enchantment to any setting. Water flows continually through the frog and into the bowl, creating a relaxing atmosphere in your garden, patio, or balcony. The low-voltage water pump and filter are powered by the included solar panel, which operates in direct sunlight. There is no wiring to run and no operating cost. Add in the one year warranty and your ready to simply set up and enjoy! This Wild Bird Feeder with Domed Cage in Green is both effective and attractive. Combines a very popular tube style feeder with an 8" diameter green wire cage that allows songbirds easy clearance through the 11/2" openings. Keeps squirrels and large birds away from the seed. The tube is easy to remove for cleaning to maintain the health of the birds. 15" long x 8" wide. This Light Blue Wooden Cottage Bird House with Removeable Back would be a great addition to your home. It has a removable back wall with a side entry hole to a single. This Spinning Metal Outdoor Garden Art Wind Spinner would be a great addition to your home.Features: -Animated design. -Season: Everyday. -Powder-coated Metal Finish. Product Type: -Garden stake. Color: -Black. Material: -Metal. Generic Dimensions: -82" H x 24" W x 6" D, 4.7 lbs. Dimensions: Overall Height - Top to Bottom: -82 Inches. Overall Width - Side to Side: -24 Inches. Overall Depth - Front to Back: -6 Inches. Overall Product Weight: -4.7 Pounds. This Green Steel Squirrel Proof Wild Bird Feeder with Hanger would be a great addition to your home. Mixed seed Squirrel proof Feeder. Adjustable weight setting on counter balance operated perch closes access to seed. 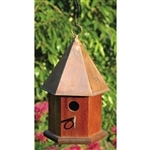 This Solid Mahogany Wood Songbird Birdhouse with Shiny Copper Roof has a stylish hexagonal body of solid cypress and a six sided roof. Remove roof and clean out debris, spray with a mild bleach and water solution then rinse thoroughly and let dry in the sun. Add an exotic touch with our intricately sculpted, designer resin monkey swaying in a tropical breeze from its 21-inch natural hemp rope. This Outdoor Monkey Garden Statue Climbing Hemp Rope will allow your sense of whimsy to shine through, as guests admire the hand-painted detail and laugh at the humor of our witty work for home or garden. Customers are encouraged to bring in items during severe weather conditions or to spray items periodically with clear coat protection to extend the life of the finish. This Heavy Duty 36-inch Black Steel Fire Pit Ring with Diamond Pattern is stylish and functional. Each fire pit will bring your patio warmth and ambiance your family and friends are sure to flock to. Simple to set up and easy to use in the backyard, at the campsite or cabin, this campfire ring is sure to be a gathering space for your family and friends. It comes in 4 pieces that are easy to put together with the included hardware. The heavy duty steel construction and black high-temperature paint ensures that the fire pit will last through many campfire seasons. Plus, the diamond cutouts will enhance any fire as the flames look amazing when illuminated during an evening fire. This 3-Tier Outdoor Bird Bath Water Fountain makes a great focal point either indoors or out. The 3-Tier Outdoor Bird Bath Water Fountain is just the right size to fit in any garden or large greenhouse. Circular base with scrolled detail holds the support pedestal. Wide-lipped bowl measures 20 inches in diameter, and is a great invitation for birds and butterflies to come visit. Two tiers rise above the bowl; both with textured edges to allow water to gracefully flow many rivulets. A wonderful, soothing sound will emanate. Made from a durable polyresin, the color will not fade. Weather-proof construction means it will last for years. The water fountain contains everything you need. Self-contained water basin and pump re-circulate water, so no special plumbing hookup is needed. Simply fill with water, and plug in! The fountain measures 20L x 20W x 35H inches. Now you can take the party with you! This Copper Fire Pit with Folding Stand Spark Screen and Carrying Case easily stores away into its own canvas carrying bag so it’s bound to become your favorite traveling companion. Enjoy it at home and then take it with you to the park, the campground, or the beach. It’s also a great tailgating accessory – roast marshmallows or hot dogs with ease and convenience. Also includes a removable screen to reduce fly-away embers and a lifting tool to use on the screen and grate. Perfect for tailgating or camping. This Large Black Steel Outdoor Fire Pit with Bear Deer Animals would be a great addition to your home. It has wildlife cutouts that glow for a unique nighttime ambience. Keep toil and trouble out of your backyard bonfire by keeping it in this 23-inch Heavy Duty Steel Fire Pit Cauldron with Stand and Cover. These hefty steel firebowls are supported by large flat steel legs that top out nicely in a curly scroll. In your choice of 34- and 23.5-inch diameter, these 13-inch deep firebowls are an attractive and safe way to warm up any backyard event. Each has a built-in log grate and comes with a screen, fire poker, and cover - just a logs and a spark and you've got yourself a brou-ha-ha! This White Wood Songbird Birdhouse with Brown Copper Roof has a stylish hexagonal body of solid cypress and a six sided roof. Remove roof and clean out debris, spray with a mild bleach and water solution then rinse thoroughly and let dry in the sun. Beautify the look of your wall with this Outdoor Patio Wall Decor Mermaid Wall-Mounted Garden Statue. Skillfully designed by renowned artist Candice Pennington, this statue is of a gorgeous mermaid that appears to be swimming in the sea. You can keep this statue as good as new by storing it indoors during the winters. Made from high-quality resin, The Outdoor Patio Wall Decor Mermaid Wall-Mounted Garden Statue lasts for years to come. It is resistant to fading and UV rays. A mesmerizing stone finish completes the look of this statue. This statue has intricate detailing and carving that enhance its realistic appearance. Customers are encouraged to bring in items during severe weather conditions or to spray items periodically with clear coat protection to extend the life of the finish. Enjoy the sights and sounds of this Blue Ceramic Outdoor Cascading Fountain Bird Bath with Solar Pump in your yard or patio. Water tumbles from one blue-glazed ceramic vessel to the next and then recycles back to the top via a hidden solar-powered pump. The solar panel can be placed up to 16 feet from the water fountain and moved to capture maximum power from the sun's rays. The bowls lift out of the weather-resistant metal frame for easy storage and maintenance. Did you just blow an hour admiring this Terracotta 5-Tier Bowls Outdoor Solar Fountain Bird Bath, watching cool, clear water trickle down from bowl to bowl, then recycle back up again? We understand. So do birds, who love to splash, shiver and primp in this serene terra cotta playground. It's nearly maintenance free: a discreetly placed solar-powered pump draws water back to the top. No wiring, no plumbing. Just add water. Don’t let cold weather keep you locked up inside this winter! Enjoy the heat from a nice fire on your porch, patio, or backyard with this Large 29-inch Outdoor Fire Pit in 100% Solid Copper with Screen Cover. The durable steel frame will serve you well for many years to come with the most basic seasonal maintenance. Use the included spark screen to protect your deck from flying embers, and our included poker doubles as a lid lifter to safely remove the lid and stoke the fire while in use. The included log grate will keep your fire roaring through any season. Gather Round. The wood-burning Copper Fire Pit with Black Iron Stand Grate and Fire Poker invites guests to linger on the patio long into the night. Crafted of iron with copper tub that fits into a curved black stand, this transitional design brings modern flair to outdoor entertaining. This Sturdy 23.5-inch Black Steel Fire Pit with Stand and Spark Screen is a unique and stylish decorative cutouts create an incredible ambiance at night. Sturdy steel construction designed for easy assembly. Decorative ring handles included for easy transport. Includes decorative spark screen, poker and four decorative legs for sturdy support. This Outdoor Garden 3-Tier Half Barrel Water Fountain would be a great addition to your home. Sparkling waterfalls cascade from spout to spout down the faces of three stacked bushel baskets. 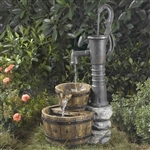 Generously sized fountain with genuine wood trim adds bountiful rustic flair to your outdoor surroundings. This Square Large Copper Fire Pit with Spark Screen and Stand is an upscale addition to your patio, deck, or the backyard. The bowl is made from thick, heavy duty 100% solid copper that can withstand years of use and harsh weather without rusting like cheaper, copper-plated pits. The grate provides excellent ventilation to keep the fire going strong until every log has been burned. Use the included spark screen to protect your deck from flying embers, while the included poker doubles as a lid lifter to safely remove the lid and stoke the fire while in use. Be sure to check out the other sizes and styles of Titan Outdoor's fire pits to find the one that best suits your needs! The neighborhood birds won't be able to stay away once you've installed this Outdoor Solar Fountain Bird Bath in Fade Resistant Resin with Solar Pump in your backyard. Made of a fade-resistant fiberglass resin, it features a fountain that gives your avian friends the joys of a shower instead of just a boring dip in some water. The 2-inch depth is also a hit with birds. Because the unit is self-contained and recirculates the water using solar power, you don't need to hook it up to a hose or extension cord. Add peace and beauty to your yard or garden with this Buddha Standing on Lotus Flower Garden Statue Cast in Quality Resin. Standing atop a traditional lotus flower, this Buddha is cast from high-quality resin and given a beautiful stone finish. Its classic design will enlighten any outdoor setting. Keep your outdoor oasis as relaxing and inviting as possible—any time of day!—with this Hexagon Outdoor Water Fountain Bird Bad with Solar Pump. Crafted of resin and fiberglass in a patinated shade of dark stone gray, this two-tiered fountain is perfect for any space. Featuring a solar panel with a rechargeable lithium battery, this fountain has a submersible pump that recirculates the water to create a continuously soothing environment. Four solar-powered LED lights complete the package, giving this fountain an alluring glow when evening comes around. This Large 36-inch Moon Stars Outdoor Steel Fire Pit with Spark Guard and Poker has unique and stylish cutouts which create an incredible ambience at night. Offers 360 degree view of fire with 40% more burn/cooking space than the regular big sky firepits. Black spark screen and poker included. This Indoor / Outdoor 4-Tier Pots Water Fountain with LED Lights would be a great addition to your home. A simple yet beautiful fountain, this distressed look will make the perfect addition to your home or garden! This 2-Tier Outdoor Solar Bird Bath Fountain in Oiled Bronze Finish Resin adds modern convenience to your garden, but it also has an antique oil-bronze finish that suits the natural beauty of its surroundings. Rather than running only when the sun is bright, this fountain works on demand, saving up energy to use whenever you want to turn the fountain on. Excess power is stored in the battery, so you can run the fountain and listen to the soothing flow of the water even after the sun goes down. It constantly recycles water and requires no cords or operating costs, so it's simple to set up and use. You'll come to enjoy the modern look of this Modern Outdoor Garden 4-Tiered Fountain with Solar Pump. Made with a mix of regular concrete and polyresin to allow for the stability of concrete without the excessive weight. A unique modern design of 4 interlocked towers, each with a tiered height for a pleasant cascading water flow. A dark stone textured finish. Made for outdoor use. Pump is included. You asked for it, and we delivered! Customer satisfaction is our top priority so when you told us you were disappointed with solar bird baths and fountains that wouldn't hold a charge, we went looking for some that did. Unlike other solar fountains that only run when the sun is shining, this Weathered Stone Finish Outdoor Resin Solar Fountain Bird Bath runs with revolutionary On Demand technology to work when you want it to. The solar panel on this fountain stores energy so you can run it when it's cloudy or even at night. We're very excited to be the only ones to offer you this fantastic product, and we hope you'll love it as much as we do. With a one year warranty, it's hard not to! This Modern 3-Tier Concrete Cast Stone Fiberglass Bowl Water Fountain makes a beautiful addition to your garden or backyard retreat. This trio of bowls is constructed of glass fiber reinforced concrete so it has the look of heavy stone and weathers very well. An integrated battery harnesses the power of the sun to operate the pump but the on-demand technology lets you decide when to use it. You'll love watching water cascade from the top bowl down to the next two. Gather around this 36-inch Bronze Fire Pit with Grill Grate Spark Screen Cover and Poker for a cozy backyard evening with friends and family. Built to take the heat and stand up to harsh weather, this fire pit has solid 1.0mm-gauge steel construction with a sturdy inner grate and a mesh steel protective covering. Spacious 32-inch-diameter deep-pit design allows you and your guests to enjoy endless hours of fireside heat. Plus, it comes with a grill grate, so get double duty from it as a grill. The protective spark screen keeps errant sparks in check, a convenient poker tool keeps the fire stoked, and the free, durable black PVC cover further protects your fire pit. The uniquely designed 36-inch Bronze Fire Pit with Grill Grate Spark Screen Cover and Poker enhances your outdoor living space and provides a warm atmosphere for all. Dimensions: 36 diam. x 27H inches. This Hammered Copper 26-inch Fire Pit with Stand and Spark Screen would be a great addition to your home. It has heavy duty spark guard cover included to prevent sparks from flying. Take a shine to fireside chatting. This Hammered Copper Fire Pit with Wrought Iron Stand and Spark Screen boasts an attractive hammered, genuine copper bowl that’s an artful base for warming flames. Inside, a removable, replaceable steel grate helps protect the bowl and extend its life. Outside, a black-finished wrought base elevates and supports the bowl. A domed mesh spark screen with a handle, a screen lift and fire tool, and a weather cover are all included. A manufacturer’s one-year limited warranty is included. Give your yard a professionally landscaped look with this 3-Tier Outdoor Garden Fountain in Durable Poly-Vinyl Composite - Bronze Color. The simple design allows the water to flow evenly down the tiers, and the deep bronze color will fit in nicely with your other outdoor furnishings. The fountain is made of durable polyvinyl composite and designed specifically for use outdoors, so it can handle all types of weather and will hold up over time. The included pump lets you adjust the water flow to suit your personal preference. This Heavy Duty Cast Iron Outdoor Patio Fire Pit Cauldron with Cover - Moon Stars Sky is a cast-iron, wood-burning fireplace that will add charm to your outdoor setting. It features a deep, over-sized cast-iron bowl with a whimsical stars and moon hand-cutout design. It comes with a removable spark screen to contain flying embers, a screen lifting tool, a log grate for proper wood-burning airflow and a protective outdoor storage cover. Keep toil and trouble out of your backyard bonfire by keeping it in this Heavy Duty 34-inch Fire Pit Deep Steel Cauldron with Screen Stand and Cover. These hefty steel firebowls are supported by large flat steel legs that top out nicely in a curly scroll. In your choice of 34- and 23.5-inch diameter, these 13-inch deep firebowls are an attractive and safe way to warm up any backyard event. Each has a built-in log grate and comes with a screen, fire poker, and cover - just a logs and a spark and you've got yourself a brou-ha-ha! Relax and unwind in your backyard with the moonlight and the warm glow of the fire from your Hammered Copper Fire Pit with Heavy Duty Spark Guard Cover and Stand. The antique rose copper finish and beautiful decorative rim give this fire pit true romantic appeal. It features a 100-percent solid copper tub with a hand-crafted hammered texture to give it an authentic rustic appearance.This vintage inspired fire pit will create an unforgettable outdoor ambiance and enjoyment for many nights to come.